The ancient belief of Jainism, shaped by the concept of non-violence which extends to animals and vegetables. Hardeep Singh Kohli explores the ancient beliefs of Jainism. He examines how the faith’s relationship with food has been shaped by the philosophy of Ahimsa - a concept of non-violence inspired by the premise that all living things have a spiritual energy. To hurt another being is to hurt oneself, which Jains extend to animals and even vegetables. 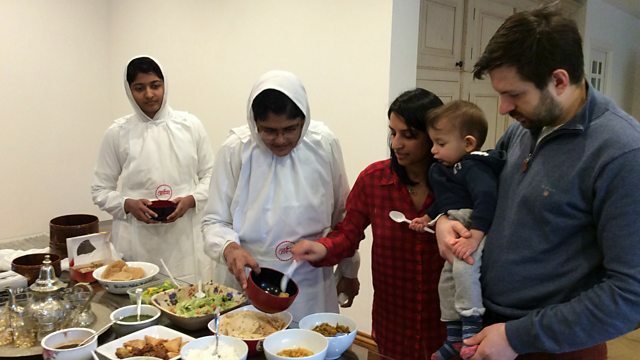 He joins the Jain community in Leicester in the English Midlands, one of the most religiously-diverse cities in Europe, to learn how food is central to their faith. Hardeep discovers that Jains are required to avoid certain vegetables on specific days of the month, depending on how they are grown, and hears how garlic and onions should be avoided. He then travels to London to meet a Jain nun who has renounced all material possessions and relies on alms from the Jain community for shelter and her food.